Abstract: Overexploitation is one of the most prominent threats facing tropical vertebrates. Management has typically adopted single-species models and has not prevented population collapse. One major complicating factor is that hunting exploits multiple prey species simultaneously, particularly in open-access systems. Using Southwest China as a case study, I found that hunting was largely sustained by resilient ungulate and passerine stocks. As hunting effort has persisted, more sensitive species have been extirpated. Recreation was the main motivator of hunting, which may be more widespread in the developing world than previously appreciated. Monitoring trends in hunting effort largely depends on human subjects interviews, and indirect surveys are powerful tools requiring specialized estimators. I developed an open-source software package, applying it to determine what factors are associated with illegal hunting in Southwest China. I explored what rules may structure hunter prey choice decisions, in order to understand how salient traits (e.g. body mass) could simplify otherwise complex indiscriminate harvesting systems. I then incorporated these findings into a theoretical model to explore potential thresholds in body mass under open-access hunting. 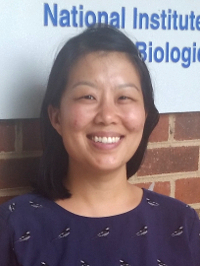 Dr. Charlotte Chang (Ecology & Evolutionary Biology, Princeton Univ.) is a Postdoctoral Fellow at NIMBioS. She is exploring the impact of diverse socio-cultural hunting practices as well as the response of hunting pressure to the spatial and temporal distribution of different harvested goods.